"The Funny... Sheesh Game Show"
The term, "improvisation," is a misnomer. It leads one to believe that all of what you see, or hear, is spontaneous, when in fact, much work and practice goes into that "impromptu" performance. Without a doubt, this improvisational group did its homework, and without a doubt, they are laugh-out-loud funny! This gathering of quick-witted comics makes great comedy out of random words, ideas, and articles submitted to them from the audience in an often hilarious interactive performance in this warm and spacious club in Manhattan's Lower East Side. Even the show's themesong, it is aptly noted, was written by "that great poetry collective known as Foreigner." Giving a blow by blow description of what happens during this hour-long fast paced performance would be like explaining a joke, so suffice it to say that each participant had several shining moments and never seemed to get flustered. At one point, the actors had to develop quick routines about an object they were given. With a large piece of electronic equipment... "You'll be just fine, Mr. Jenkins," he explains, attempting to attach the item to make-believe patient's chest, "as soon as I get this pacemaker put in. And thanks for coming to "Surgery Stop." A small 1" x 2" piece of plastic packaging became a protective "cup" for a poorly endowed athlete. Whether the bit concerned a trek up the Andes Mountains in heels or "The Wild One: The Musical," the cast was consistently fast and funny. These guys are good! Non-offensive humor that is bright, funny, witty, and sometimes even hilarious, is hard to find, but you can find it right here, every Sunday night at 7:30. Plus, true to the game-show theme, prizes for some well-deserving audience members. All without a cover charge. And that's no joke. I'm not a particular fan of Improv, because, in a city like New York, where entertainment practically grows on trees and, well, everybody's a comedian, it's much easier to think you're funny than to be funny. And with a name like Funny Sheesh, well, it doesn't actually fill you with confidence, does it? And yet, that's what the Funny Sheesh comedy collective does, week after week, at it's regular Sunday night slot at the Sidewalk Café. They instill you with confidence in the state of Improv, as well as the state of strangely-named comedy troupes in general. Featuring a revolving cast of terribly funny people but led held together by the sheer willpower of a mister Jason Grossman, Funny Sheesh serves as a game show, in which prizes are randomly given out to people who were willing to show up. It's not just the prizes that keeps me coming back -- though I got a pretty neat plastic axe one fun Sunday -- clearly, it's the comedy. The comedy's good. The comedy's original. And, like in a lot of Improv, the comedy's dangerous. One particularly memorable mock soap opera entitled "Adolph Hitler, Adolph Hitler was well, I can't quite say. I can say, though, that the musical stylings, added by the conveniently located baby grand and the singing voices of most of the troupe, as well as the chaotic organization of the entire game show format, leave me pleased, pickled and prepared to go back, again and again. 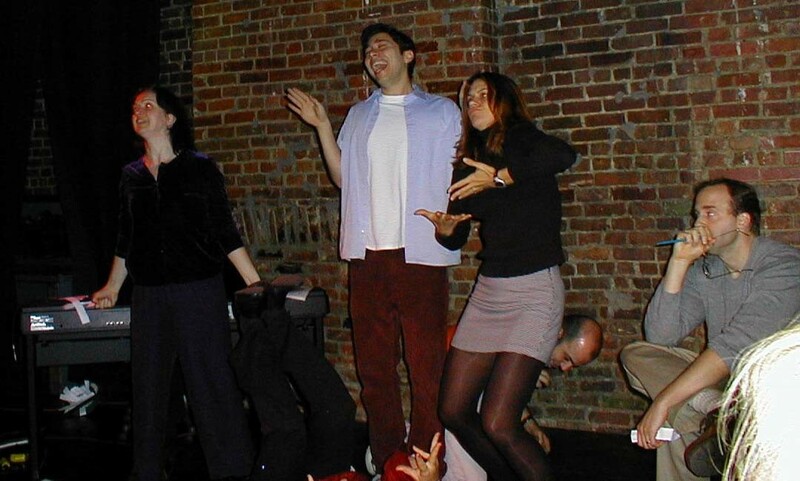 Sharon Fogarty, Sam Riegel, Leanna Conley and Tony Hightower (on the floor) make "movie magic" on stage with the assistance of Kenny Davidsen on piano (hidden) as emotionally moved "film critic" John Hartmann looks on the masterpiece.